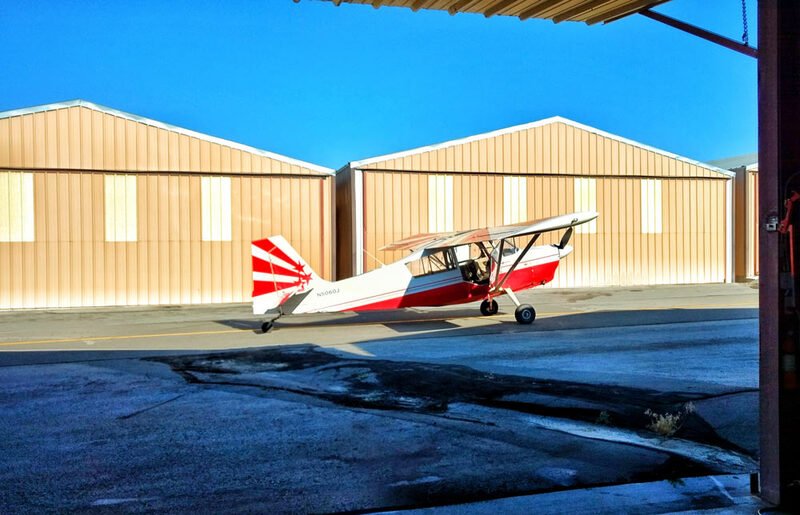 Home » Aviation Articles » General Aviation » My First Aerobatic Flight: I Can’t Believe I Just Made the Plane DO THAT! 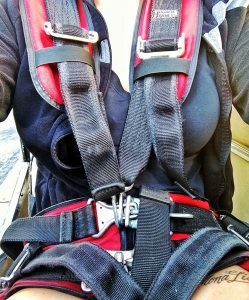 By the end of my first aerobatic flight, I realized my hands were shaking too bad to un-ratchet and unhook myself from the 7-point harness. Unfortunately, flying in the high desert in the middle of summer isn’t very comfortable, if you can get off the runway at all! (Density altitude can be a real drag sometimes) So, we rescheduled, and the day finally came. I drove way faster than I should have and left way earlier than I needed to, which resulted in me sitting on the hood of my car, enjoying the serenity of an airport still asleep. Tim pulled in in his little car, and I was already halfway to the hangar door before he got his seatbelt off. Excited really doesn’t do the butterflies in my stomach justice. He pulled the Decathlon out of its cozy hangar, wallpapered with airshow fliers, awards, certifications, newspaper clippings and various other aviation memorabilia. As he “kicked the tires,” I admired this beautiful little taildragger. This was going to be a day of firsts. 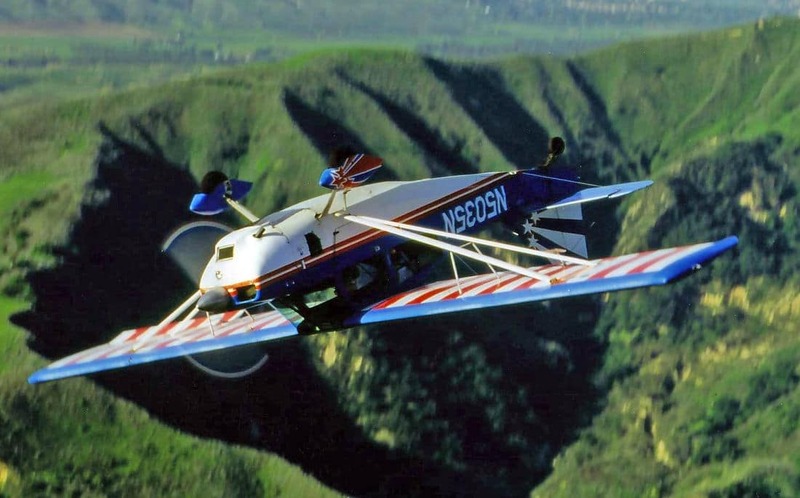 Obviously, I had never done any aerobatic maneuvers, but I had never been in a taildragger either. 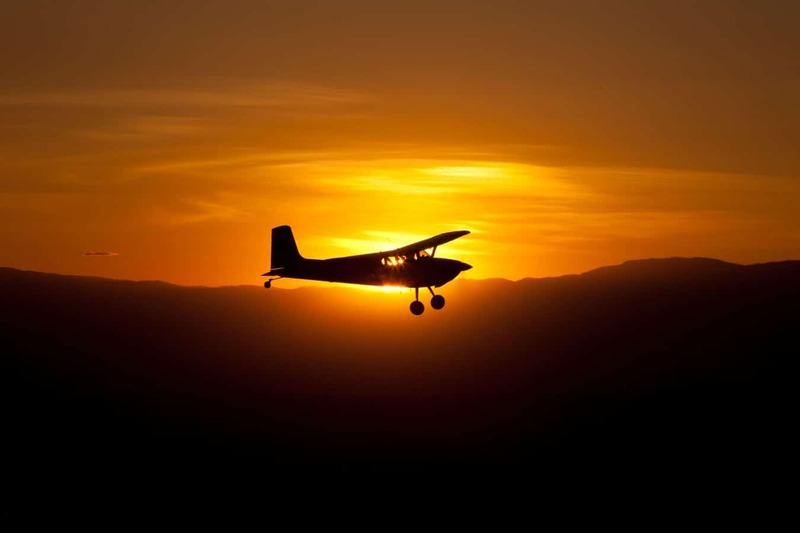 From the many different aircraft profiles I’ve written, I’ve gotten the idea that taildraggers are treacherous to taxi and so difficult to land they’re barely insurable. I’m happy to say that isn’t true, and we taxied and landed with only slightly more effort than in a nosewheel. I enjoyed the push-and-release rudder input, as opposed to the “glue your foot to the pedal and hope your legs are long enough to turn the darn thing” technique I’ve learned flying nosewheel Cessnas and Pipers. Eventually, we wiggled our way onto the runway, Tim had me push the throttle lever all the way forward, and off we went! We took off and climbed up into “the box,” getting ourselves enough altitude to maneuver directly over the airport without getting in anyone’s way. We started small, with Tim re-educating me on the three main controls as used in aerobatic flight: Pitch moves the nose from your head to your toes, rudder wiggles the airplane from ear to ear, and the ailerons rock your shoulders up and down. Then we practiced some “steep turns” (As Tim put it, your airplane is capable of turning 360 degrees. So, 45 degrees, or just an eighth of its turning capacity, isn’t really all that steep), which then turned into wing-overs, and finally some Chandelles. So that covered the rocking, now it’s on to the rolling (pun intended). I didn’t really know that they were coming, however, Tim just said, “Now let’s try something a little different,” and then announced his control inputs. Nose up 30 degrees, return elevator to neutral, and full right rudder and full right aileron! I couldn’t help it; I let out a pretty loud “Woooo!” over the headsets. Sorry, Tim. Seven point harness in the Super Decathlon. The barrel roll! Every time I hear that phrase, I’m reminded of the Nintendo 64 video game Star Fox, where you play a fox flying a star ship. Peppy Hare, the mission advisor, would yell, “Do a barrel roll!” every time an asteroid came your way. Apparently, it made a big impact on my young brain, because I kept hearing that 64-bit rabbit giving me flight instructions. I enjoyed the barrel roll even more than just an aileron roll because I love the feeling of loops and staying inverted for a little longer. But we’ll get to that. Next up, the Immelmann. The Immelmann. I’ve read about it, watched videos, and even ordered a salad by the same name at an airport restaurant once! I’ve seen infographics and the official Arresti notation, but nothing prepared me for how FREAKIN’ AWESOME it is in real life! Essentially, it’s a half inside loop with a roll at the top to get you back upright, but it feels so much cooler than it sounds. We dove, rapidly gaining airspeed. I could hear the engine change pitch as we hit 165kts and the tachometer flirted with the red line. Then he pulled back on the stick, and suddenly I was upside-freakin’-down, the elevator neutral, the peak of Mount Rose level with my nose out the front window, the vast, empty blue sky below me. I laughed with pure joy. I’ve waited so long for that exact moment, imagined it so many times. It was over much too quickly as Tim pushed the stick to the right and we rolled out of it, the valley floor below us again. I yammered breathlessly about how amazing that was as we climbed back up to gain altitude, and then it was my turn. I’m sure it wasn’t to IAC standards, but I did the half loop and twist, unbelieving the entire time. I just made an airplane do that. I just made an airplane go upside down! I still can’t fully wrap my mind around it. We did one more, and then again, it was on to the next. I suspected what was going to come next, and I was so excited I was bouncing against the restraints. A loop, a full loop! Then it was time; we were heading back towards the ground again, hurtling toward a face-melting 165kts, faster than I’ve ever flown- straight at the ground at any rate. All of a sudden, we were applying back pressure, more back pressure, more back pressure, and suddenly we’re pointed straight up. Watching the mountains dip below the nose, replaced by the sun glaring through the windshield, was unbelievably exciting. Then, I felt my body grow heavy, hanging against the 7-point harness, my thick-soled shoes weighing 100lbs, heading toward my nose. I was laughing like a little kid being twirled around by the arms. This is flying. This is what it’s really about. We did a couple more loops, each one better than the last. I didn’t want to stop; I could do loops and rolls all day! With the next maneuver, however, one or two was just fine for me. I realized halfway through that the PARE acronym every student pilot has memorized for spin recovery is the exact opposite of the procedure you use to get yourself into a spin. It makes sense really. For the first one, Tim demonstrated. We brought the Decathlon down to under 60kts, and stalled it. Once fully stalled and it began to lose lift, Tim pulled the nose high, pressed hard on the right rudder, and we snapped into a spin. I watched the world whirl around me with glee. As we came to a stop, however, I felt a little dizzy. I was fairly disappointed in myself, because I didn’t think even spins would get to me. But as Bryan later said, they’re a “violent” experience. Next up, it was my turn. It seemed strange that this terrifying life-or-death situation private pilots are warned against at all cost took some coaxing to incite, and seemed fairly simple to recover from. Though I concede that knowing it’s going to happen and knowing you’re in control would feel a lot different than accidentally getting into a spin low to the ground with no aerobatic instructor in the back seat. We did a couple more of those, and though it made me a bit uncomfortable toward the end, it’s made me feel a lot more confident in the cockpit flying the Piper Cherokee during my regular lessons. Finally, it was time to land. I knew Tim had a checkride right after, so I couldn’t convince him to keep flying with me, but that’s not to say I didn’t try. 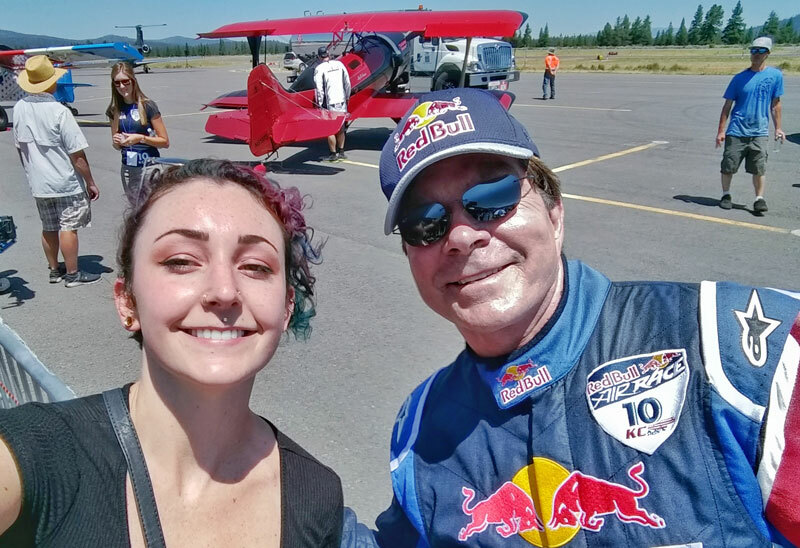 He said it’s best to just do a few maneuvers the first time because people tend to feel “beat up” after aerobatic lessons. I mentally scoffed, thinking, I’m young, in-shape, and super excited about aerobatics, I feel great! but said nothing. Our final adventure was to be a couple maneuvers concluding in a victory roll, which is kind of hard to describe, so instead of listening to me try, watch the video I shot! First, we stalled it, then rolled it, then gained some airspeed and did a sort of barrel roll like maneuver with an Immelmann tossed in. Or at least, that’s what it felt like. You tell me! Anyway, after that final trick and filming the video that got me scolded by my mother, we landed. I waited with bated breath to experience the “horrifying” and “impossible to master” taildragger landing. Naturally, it was a beautiful landing that didn’t seem much different than a nose wheel landing. As Tim said after I complimented him on greasing it on, he said, “The people who talk about how difficult taildraggers are, are the pilots who don’t fly them.” C’est la vie, non? By the time we were taxiing toward the hangars (Tim had me shut the airplane down on the roll, which was fun) I started to feel a little… strange. It wasn’t until we stopped and Tim hopped out that I realized my hands were shaking too bad to un-ratchet (de-ratchet? dis-ratchet?) and unhook myself from the 7-point harness. After I managed to finagle my way out of the Super D, I chatted with Tim and his friend who was going to be checked out after me. We talked about my aspirations to become an airshow pilot, different styles of aerobatics, and the disturbing lack of women in the sport. 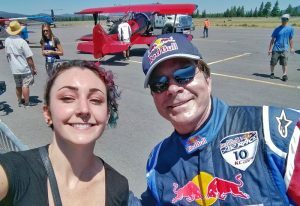 Tim told me aerobatics needed more women, and I said I’d be happy to oblige! I got my logbook filled out with “turns, rolls, loops, spins, and Immelmanns,” and my first bit of tailwheel time, and went on my way. I couldn’t get the hysterical (in the literal sense) expression off my face for the rest of the day. I had these crazy wide eyes with surprised eyebrows combined with an uncontrollable glee (occasional fits of laughter included). I just couldn’t believe that I finally experienced all these amazing sensations I’ve been dreaming about, and it was even more awesome than I thought. I can’t help but wonder how much cooler they’d be in a high-performance aerobatic plane, like a Pitts or an Extra, but I think my eyes are bigger than my wallet in that case. I slept like a baby that night, visions of aerobatic maneuvers dancing in my head. I can’t really describe how much that hour, my first aerobatic flight, meant to me, but I feel like a different person. Not in any dramatic way, I’m not prone to that level of hyperbole, but in small ways. A sort of contentedness has settled into my heart, almost a sensation of relief that accompanies falling in love- and in part, discovering my purpose.